Legal Name - THE CHARTER CLUB OF PALM BEACH CONDOMINIUM ASSOCIATION, INC.
One pet per unit and pet is not to exceed 25 lbs. 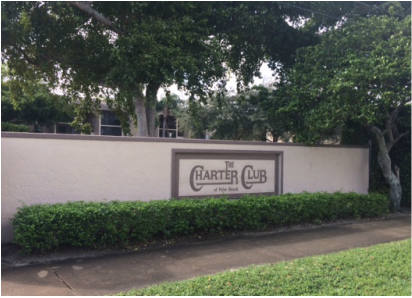 Leases - $500 refundable common area security deposit payable to “Charter Club Condo Assoc. Inc."
ASSOCIATION APPROVAL REQUIRED PRIOR TO ANY LEASE OR SALE – Association shall have thirty (30) days from receipt of fully completed lease/sale application to approve or disapprove. Residents may NOT move in until approved. A unit may not be rented more than twice during any twelve (12) month period. No rental may be less than a three (3) month term. 1 assigned parking spaces. "head in parking" only. Two (2) parking deals allowed. “Guest pass hanger is good for up to seven (7) consecutive days and no more than thirty (30) day in a one (1) year period.